Today, i’m lucky to share with you an author who has a truly unique writing style. Each word and story arc carefully thought out. There are a multitude of ways I respect her writing, so when she told me she had a new story out, I had to find out more.. So peek down below and read all about Kastil Eavenshade’s latest book, An Outlaw in her Bed! An Outlaw in her Bed! An outlaw by trade, Travis Colburn refuses to be tied down by a woman. Life on the run leaves him no room for love, until a calico queen’s wicked lips tattoo his soul. Her searing kiss leads him on a path entwined with the devil himself, and nothing will stand in his way—not even cold lead from a gun. When a bullet steals her husband’s life, Ella Gilby gets more than she bargained for from a tall, dark stranger. Death walks in his shadow and the temptation he offers swallows her whole. The more she denies the attraction, the more her desire for the deadly desperado draws her back in. It wasn’t my Star Wars. I didn’t feel the emotions of the rest of the crowd. Halfway through, I found myself thinking of a book I’m writing. And I just have to say. I left the theatre with no feeling for that movie at all. In contrast, I walked into a theatre when I was a child. I read every word on the screen as it scrolled down. I remember thinking that it was a brilliant eye-catching way to capture my attention. Deep thoughts for a kid who still played with Barbie dolls. I walked out of that theatre with an entirely new concept of storytelling. I believed the characters. Luke wasn’t just a whiny boy; he was a kid who looked sad while everyone else talked at a table because he missed his aunt and uncle. He was a kid who was scared and didn’t want to leave home. He did it anyway, not for a princess but for an old man who was a friend. So when I went to see, well that movie. It was my star wars. When I walked out of that theatre, sadness tugged at my heart. It wasn’t wasn’t my Star Wars. When a director or a writer places a mark on a movie. His thoughts do more than go into the page, more than direct the movie, they direct the theme of the movie. I miss the young George Lucas and despite the flaws of the last three Star Wars movies, I will always be grateful for the first three. For his thought process, his youthful excitement and his love of the unknown went into it. So thank you, George Lucas, thank you so much for my Star Wars. TROUBLE IN PARADISE & LONDON SAINT JAMES! After propping up the hood, Sutton stood on her tip toes, waved a hand about in an effort to keep the smoke from her face, and glanced at the guts of the truck—as if she would know what she was looking for. She supposed the doing made her feel as if she were taking proactive measures about the situation, until the coughing started. Perhaps sticking her head beneath the hood hadn’t been the best idea. Covering her nose with one hand, still swiping the foul air with the other, she took a step back. The breeze kicked up and blew another puff of nasty at her. She coughed yet again and stomped a booted foot on the pavement, irritated. Kale’s morning had royally sucked. He hated when he had to put down an animal, and as a result, he’d pretty much been in a mood when Flint called him about Maeflower. He sure hoped he didn’t have to put two horses down in the same day, a fact he’d been grumbling about under his breath when he jumped in his truck. But after leaving his office and driving down Main Street, he saw something with the potential to vastly improve his afternoon. The corner’s of Kale’s mouth turned up into a smile as he pulled his F-150 dual cab into the parking lot of Dunning’s, watching Sutton Callaway doing the hippy, hippy, shake in tight daisy dukes, a faded turquoise T-shirt, and turquoise cowgirl boots. A $20 Amazon Gift Card! A friend asked me how my diet was going, and I told her the truth. I crashed and burned Sunday night and ate everything in the house. And to her getting to your goal weight is the successful rough. To me? Changing a lifetime of bad habits is the goal. I don’t need to get back back on track. Why? Because I’m older now, a wee bit wiser. I know myself better than I did a few years ago. I’m not going to pretend that I’m not an emotional eater. I’m not going to pretend that I got this way by eating clean every day of my life. I didn’t. And i’m not going to pretend that I have ruined my diet by a one day slip. The fact is. I’m human. I cry, I make mistakes, I eat brownies after calls from my Mother-in-law. I also know that eating badly for one night isn’t the end of my diet. It’s just going to take me longer to get to my goal. That of being a healthy eater. It takes a while for a person to change bad habits but beating yourself up over slips in life is pointless. Change, grow, be yourself, take your time getting there. It’s the journey I’m undertaking. And for once, I’m ready to take it. Everyone ready for a little Midnight Dawn? I’m squealing. I’m fangirling. I’m buying a book! 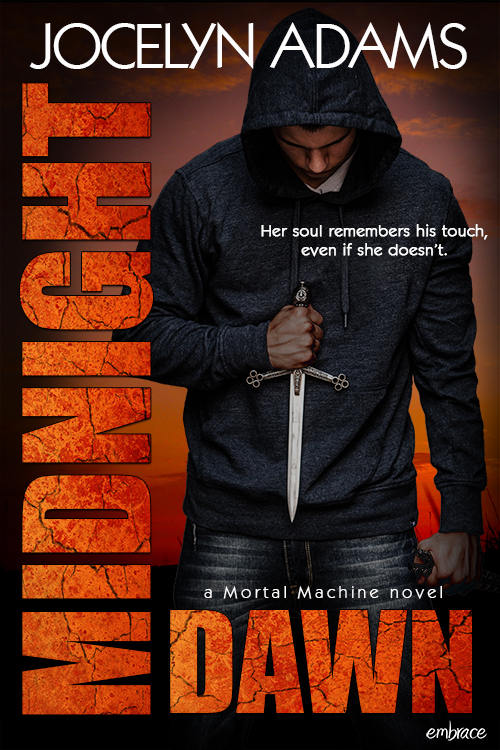 I’ve been waiting for Midnight Dawn for so long. And guess what? It’s here! So please read on for a sneak peak! love her back, or a powerful stranger who insists they’re meant to be together. Her decision will determine the fate of humanity, and once decided, can’t be undone. With no formal training, she relied on the honest feedback of her writing group to take her from that first short story all the way to THE END of her first novel. She now has eight published novels and has recently signeda 3-book deal with Entangled Publishing.